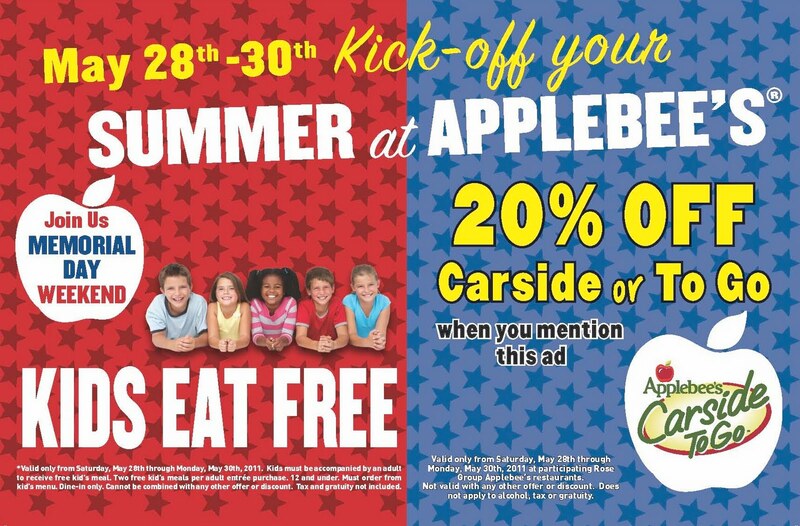 Kids Eat Free at Applebees on Memorial Day Weekend + 20% Off Carside or To GO Orders! If you are looking for somewhere to eat on Memorial Day weekend, May 28th -30th, Applebees is offering two great deals! Kids 12 and under eat FREE with an adult purchase. There is a limit of two FREE kids meals per adult entree. Or, if you would rather order Take Out to enjoy at home or at the pool, they will also be offering 20% off all Carside or To Go Orders when you mention THIS AD.